Are you proud of your smile? Do you look at magazine models and movie stars wishing you had the same confident grin as them? If your front teeth are discolored, stained, chipped, cracked, slightly misaligned, or have metal fillings, consider veneers. Made from thin sheaths of porcelain layered atop each other, veneers can completely cover the front of your teeth to create a perfectly shaped, dazzlingly white, and absolutely gorgeous smile. The most modern veneers look completely natural, too! After a comprehensive exam, we will develop a cosmetic plan that will make your weak smile strong again. Veneers, also called laminates, are long-lasting and stain-resistant, and they require only two visits in order to complete treatment. In fact, you’ll leave the first appointment with a set of temporary veneers while your custom final veneers are being crafted at a lab. A popular brand of veneers is Lumineers because they require no tooth reduction and are reversible. 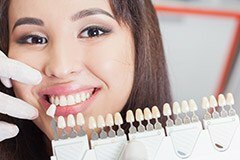 To see what your smile would look like with veneers, we recommend you review our before and after cases, request a diagnostic wax up, or ask us about digital imaging, a computer program that can create an image of you with your new veneers. These tools can help you decide if they would be a good choice for your smile. Because we custom craft each patient’s veneers, you can choose the shape, color, and style that best compliments your appearance and the image you want to achieve. Call our North Kingstown office to schedule your porcelain veneers/Lumineers appointment with Dr. John Verbeyst or Dr. Philippe Morisseau. Our practice sees patients from North Kingstown, South Kingstown, Exeter, East Greenwich, and other Rhode Island communities.